I ran across The Chronicles of Solomon Kane at a discount bookstore last week and promptly snapped it up for $2.50, attracted by two names: Robert E. Howard, who wrote the original prose stories, and Roy Thomas, who adapted them to comic form. These stories were published by Dark Horse Comics in the 1970s and 1980s, at the same time that Howard’s Conan the Barbarian was also translated successfully to comics. I’ve read several of the original Solomon Kane stories and these adaptations not only do them justice, I liked them better in graphic form. The eerie atmosphere of the tales of the wandering Puritan is comes across perfectly in the art, as does the oddness of the man himself. I found copies listed on Amazon for less than $3. That’s a steal, as was what I paid for it. This past week while looking through some kid’s comics, I stumbled on the Ultimate Spider-Man issues #66 and #67. I don’t normally just pick up and read a random issue, but after seeing Wolverine’s image on the front of issue #67, I was intrigued. This was my first experience with reading a Spider-Man comic and I was pleasantly surprised by how much I liked it. 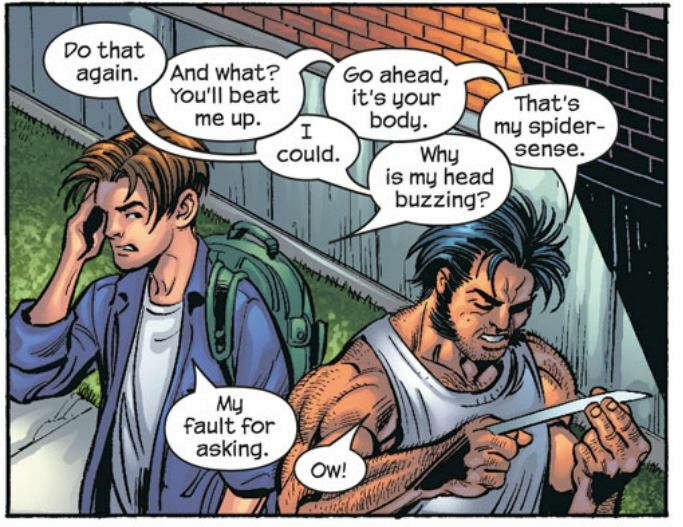 The story centers on a Freaky Friday-like body switch between Peter Parker and Logan. Each of them wakes up in each others’ bodies without any idea why. Unfortunately, Peter could not have had his mind switched with a more socially irritating person. It takes two issues of back and forth between them before the real cause of their predicament is revealed. I have to say Peter handled it well, considering. I felt bad for him and everything he had to go through so that Logan could learn a lesson. He was an innocent bystander and I don’t blame him one bit for his reaction to why it all happened. After all, it was Peter Parker, not Logan, who had to clean up the mess in the end.